Is it possible to generate visual behaviour on a screen? Yes, in part you can, thanks to an in-depth knowledge of the non-conscious visual system. Many works refer to the Gestalt principles, but in a very theoretical manner. Very few of them explain how to use them when creating screens. I will introduce this subject in a series of successive posts. Let’s start now with the first point: the first thing a user’s visual system will do when he arrives on a screen is to evaluate the content of the screen, by using what we call the visual landscape. 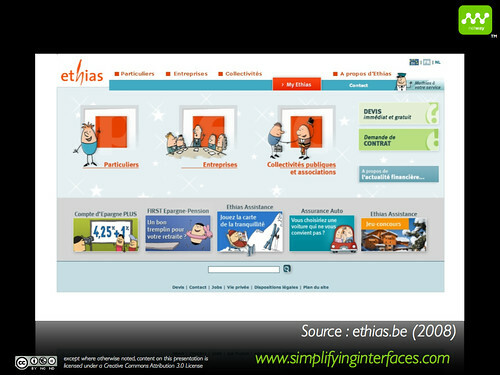 To illustrate the concept of the “Netway Neuro-Visual Landscape”™, I will use a screen from the Ethias site. This screen has been made by our experts, using all the techniques of behavioural sciences. 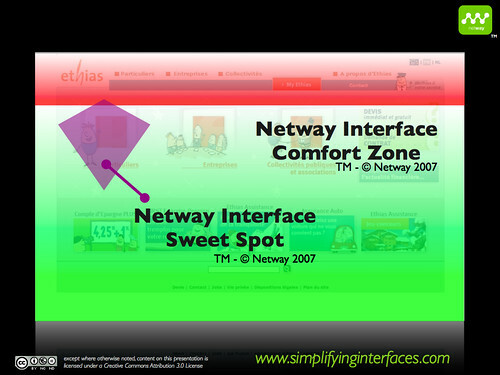 When a user gets to a screen, we have seen that he starts by looking at the “Netway Interface Sweet Spot“™. The brain will automatically direct our eyes to that zone. In but a few milliseconds our brain will receive visual information from our eyes. These data will come from the field around the first ocular fixation in the “Netway Interface Sweet Spot“™. The zone around this point is limited and as a result the majority of visual information will be blurry. It is however this information our brain will use to create a first version of the screen in our visual memory. Depending on the scenario to perform, the brain will choose the place in the visual landscape to which he will send the eyes. The task: to gather information a second time. This will result in new information that will feed the visual map of the screen our brain has memorized. This will be done 3 – 5 times in order to have a standard version of the visual landscape of the screen. This landscape does not contain all the visual elements of the screen. This final version is the “Netway Neuro-Visual Landscape”™, the map our brain will use when the user performs the tasks he wants to do on the site. So, what happens when an important element of the screen fails to appear in the “Netway Neuro-Visual Landscape”™? Something we have all witnessed will happen: we look for an element on an interface but we can’t see it, although it is there. If we take the time to consciously control our visual system and look at all the elements on the screen, the element we couldn’t see before, will appear. When we build a screen it is important to think about an efficient “Netway Neuro-Visual Landscape”™. Thanks to the “Netway Neuro-Visual Landscape”™, we can also explain a well-known phenomenon: the designer syndrome. This syndrome is simple: since the designer works at the conception of the screen, using both his eyes and his brain, his “Netway Neuro-Visual Landscape”™ will be much richer than that of a regular user. I ask all designers and team members to remember this difference when they are working. Next week, I will talk about the 3 to 5 points our brain uses to build the “Netway Neuro-Visual Landscape”™.